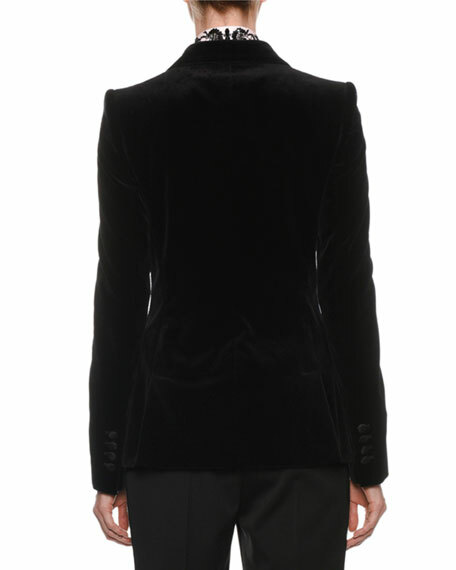 Dolce & Gabbana velvet jacket. Dolce & Gabbana pinstripe wool jacket. Peak lapels; one-button front. Long sleeves; button cuffs. Side flap pockets. Tailored fit. Virgin wool/spandex. Made in Italy. Dolce & Gabbana jacket in light-wool. Peak lapels; one-button front. Long sleeves; button cuffs. Side flap pockets. Tailored fit. Virgin wool/spandex. Lining, polyester/spandex. Made in Italy. 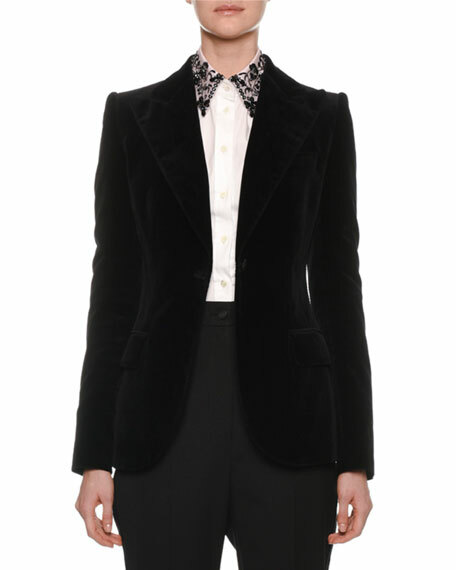 Dolce & Gabbana single-breasted tuxedo jacket. Satin peak lapels; one-button front. Long sleeves; button cuffs. Strong shoulders. Front flap pockets. Dolce & Gabbana blazer in sequined leopard print. Solid shawl collar; one-button front. Long sleeves. Hip flap pockets. Fitted. Cutaway hem. Polyester/silk. Lining, silk/spandex. Made in Italy.